A UMass alum (not me) is considering hosting a tail gate party for the Delaware game down in Newark. He is thinking of a $5.00 donation and he will supply the goodies. All members of the UMass family would be welcome. If you are interested, please email me (my email address is in the "About me" section of the blog sidebar) and I'll send you his email address. He'll want a commitment (so he won't get stuck with the food) and a head count. The UMass athletic dept site has Coach Morris' weekly CAA teleconference transcript posted. Armando Cuko is 9-11 on field goals and has gone 4-5 in attempts over forty yards. Cucko leads the CAA in scoring with 13.3 points/game. CAA stats through last Saturday here. The CAA's season gets going this week with eight league teams having a conference game. The Big Game is #5 William & Mary visiting #2 Villanova. The game will be on national TV on the Versus network. Keepers' college football rankings site has Villanova by 7.64 over the Tribe. Hofstra already has two D-I losses (Richmond and Western Michigan), a loss to JMU would mean the Pride would probably have to run the table to make the playoffs. Despite this, DNR Online says there is not much buzz for the game. David Coulson of the Sports Network has his weekly "Around FCS" column up. Scott is 6-3 195 and runs a 4.6 forty. His Rivals page is here. He's a Rivals two-star recruit. ESPN page and video here. Another article that mentions Scott here. He has an offer from Northeastern and interest from UMass, Rutgers, UConn and Pitt. Matty Vautour has an article on UMass taking advantage of the the bye week. He also has a link to an article about Marcel Shipp. UMass' Freshman DL Kevin Byrne gets a mention in the Cap Cod times. Two articles on WR Jeremy Horne by Matty Vautour and the Albany times. The consolidated FCS polls here. Article on the Sports Network's poll here. Keeper's College Football rankings has UMass up to #7 after the win over Stony Brook. Click on image and Blogger displays a much large view. Image is of UMass FR. LB Devin Lindsey 6-0 225 from University City, MO. The 43-image web album is here. Nothing very great because of the low light levels, but it should give you a sense of the game. UPDATE: Fr. LB Perry McIntyre is the CAA Rookie-of-the-week. Matty Vautour has a short update here. Matty Vautour has three stars from the Stony Brook game and they are: Jonathan Hernandez, Jeromy Horne and Chris Zardas. He also says how good the Minutemen are is yet to be determined. The UMass Daily Collegian has a story featuring Hernandez' big day against Stony Brook. 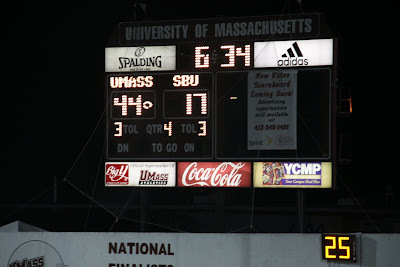 From the UMass Athletic website:"
Saturday's game was the final for the scoreboard in the South end zone of McGuirk Stadium. It was installed in 1995. Pieces of the scoreboard will be auctioned on UMassAthletics.com in the coming weeks." CSN has all the FCS scores from Saturday's games here. Josh Buchanan has Vladimir Ducasse as the #2 ranked "Small School" NFL prospect. He also has Jeromy Miles ranked #30 in the top 50. Josh evidently has not seen some tape of Miles' play this year. The CAA stats inclusive of the Sept 26th games are up. UMass is #1 in pass offense, #1 in total offense, #1 in punting. The Minutemen are #2 in scoring offense and #2 in scoring defense. There is a big improvement in UMass penalties. the Minutemen are #6 in the league and one team ranked ahead of them has only played three games. Kansas State crushed FCS/I-AA Tennessee Tech 49-7. Albany won its 14th consecutive NEC league game over Sacred Heart 22-9. Rhody lost to UConn 52-10. UMass overcame some errors to crush the Sea Wolves 44-17 last night. UMass Athletic Dept has notes, quotes and a picture gallery here. Stony Brook Athletic Dept article here. The Boston Globe said "UMass banded together". The Boston Herald said "UMass was in tune." The Springfield Republican has UMass rushing for five TD's. WWLP has UMass with a big second half. Matty Vautour said UMass and Jonathan Hernandez ran over the Sea Wolves. Besides Jonathan Hernandez, who had 140 yards, three TD's and a 4.8 average, Cedric Gonnet dragged the whole Sea Wolf defense fifteen yards on one carry. Chris Zardas had two TD's and a 4.8 yard average. The CAA re-cap of all the league games is here. There were some interesting results. Maine and Syracuse combined for 27 penalties in a harder than expected win for the Orange. I'll be back with a web album of the game, perhaps this evening. The UMass Marching Band is superb this Year! I don't know who is the governing body for the Sudler Trophy, but the UMass Marching Band has be bringing in a bunch of first place votes. The Band has just been superb this year. The sound just knocks me out. 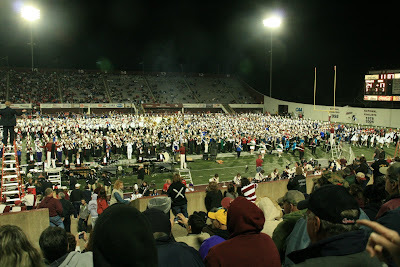 Last night's UMass band day was a tour de force. The assembled bands rocked out with "Won't you come home Bill Bailey" and closed with "America the Beautiful". 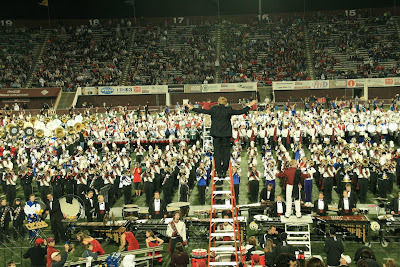 This Blog thinks it was one of the best Band Days ever. It's just a vintage year for the Band. If anyone deserves a second Sudler Trophy, it is the wonderful UMass Marching Band. I tell you UMass fans have to be a hardy breed. I see the same people every year for decades. Sometimes it seems as if the UMass administration goes out of their way to piss off the season ticket holders. What is the use of having a "Yellow Lot" if all but one entrance to the lot are closed. Funneling all traffic into one congested entrance certainly raises my blood pressure. Apparently it did so for other people as several fans came up to me and said "You should put that in your Blog!". UPDATE: Channelsurfing.net is listing streaming video for the UMass-Stony Brook game. As I have said before, I've had mixed results with the Channelsurfing site, but if you are part of the UMass nation not in New England, it's worth a try. WWLP has a video interview with Coach Morris on not letting down against Stony Brook. Matty Vautour says UMass can't afford to look past Stony Brook. Kyle Havens talks about his receivers at UMass. He mentions Victor Cruz, Jullian Talley and Joe Sanford. Tony Nelson can catch the ball out of the backfield and hopefully Jeremy Horne will be recovered from his concussion. The article mentions his former favorite WR John Hendershott, now at Sacramento State. Stony Brook has a run heavy offense. Last year the Sea Wolves had TWO runners pass the 1,000 yard mark. Senior Conte Cuttino did it, as well as super Soph Ed Gowins who rang up 1,310 yards and a 9.4 yards/carry average. Gowins was Sporting News National Freshman-of-the-Year. This is the first year Stony Brook has reached the 63 scholarship level, which is the maximum for FCS/I-AA football. The Sea Wolves last second win over Brown was their first ever win over a Ivy League program. Although it's still September, there are a couple of big games in the CAA this week. James Madison ranked #6 visits #24 ranked Liberty. The Big South does not have an auto-bid, so Liberty needs to beat the Dukes and then run the table in the Big South to make the playoffs. Liberty played well against West Virginia and beat Lafayette last week. The other game with playoff implications is Delaware's visit to #5 William & Mary. The Hens already have one FCS loss against Richmond. Two losses in September in the CAA will give Delaware an uphill battle to make the playoffs. Two losses in the CAA South will also put the Hens on the wrong side of several tie-breakers. CSN has a couple of articles up. Bruce Dowd has his weekly "Dowd's Den" and Chuck Burton has "The FCS Way". Stony Brook finally has its game notes up for UMass. Html here and pdf here. Matty Vautour has a nice story about Senior starting OL Jared Chivers. Vautour reports Chivers has a secret weapon ---- Hamburger Helper. The Berkshire Eagle has another story about Chivers here. 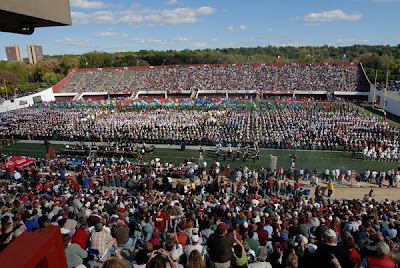 It's going to UMass Band Day! Terence Thomas, Sr. does his weekly "CAA Today" column here. Dave Coulson of The Sports Network offers some "Deep Thoughts". The 2009 season just got a little tougher for the Maine Black Bears; their top running back Jared Turcotte is gone for the season. Mark Whipple continues to gather ink because of the resurgence of the Miami Hurricanes. Articles here and here. UMass QB Kyle Havens---in only his third start-- has won the New England Gold Helmet award. Matty Vautour has a post on Havens' win here. The UMass Collegian has a story about Ke'Mon Bailey's transition to cornerback. Bailey has been a pleasant surprise as a defensive back. He is always around the ball and has played aggressively. Bailey certainly looks as if he has found his position. Still no game notes available from Stony Brook, but this article by the Seawolves head coach Priore indicates that Stony Brook has some injury problems. Interesting article about James Madison's senior TE Mike Causin. Who'd have thunk it---- New Hampshire is leading the CAA in defense. Lates press release from the CAA about the league's holding six of the top 15 slots in the polls. The Sports Network's Brett Kahn previews the top twenty-five FCS games this week. Keepers college football ratings have UMass by 23 points and change over the Seawolves. 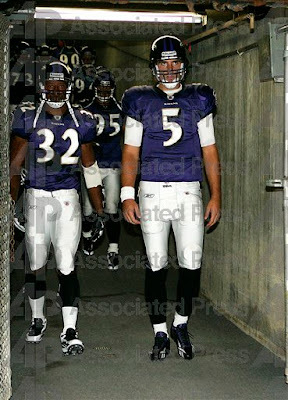 Matt Lawrence and Joe flacco walk out of the tunnel. Sent to me by a member of the Lawrence family. Christian Koegel still has NFL dreams. UMass game notes for Stony Brook in html. And here in pdf. Stony Brook game notes are not up yet. The CAA has its weekly football article up here. Matty Vautour has his "Path to the Post Season-IV" up here. Kansas State's game notes for the Tennessee Tech (1-1) here. The Golden Eagles lost to #22 Eastern Kentucky in their OVC opener last week. Coach Morris' CAA teleconference transcription here. It looks like first string Stony Brook QB Dayne Hoffman is gone for the season. Backup QB Michael Coulter will play against UMass. Two Seas Wolves players won Big South conference honors last week. The Springfield Republican has a story on UMass WR Victor Cruz, who is now on track to graduate. The URI student newspaper has a story on the Rams-Minutemen game. UMass gets one #16 and two #15 places in the latest FCS polls. The CAA will have its first ever nationally televised game on Oct 3rd when William & Mary plays Villanova. The Sports Network's David Coulson looks at last weekend's games including Albany's comeback win over Maine. It looks like UNH is losing its historic series with Dartmouth. 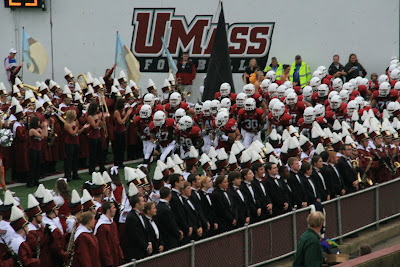 I have 41 images of the UMass-Rhode Island game in a Picassa Web Albumn here. Note that the images will also enlarge if you click on the tiny magnifying glass symbol in the upper right corner of the display. UMass is interested in Brian Bozek a 5-11 195 pd LB/DB from Laconia, NH. The New Hampshire football report has news about him here. Also interested are UNH, Boston College, Duke, Syracuse and Vanderbilt. He plans on attending the UMass-Stony Brook game. Image by the Laconia Citizen. UPDATE: Kyle Havens is the CAA Offensive Player-of-the-week. Not bad for his third start. UPDATE II: More from UMass about Havens' award. CSN has all the FCS scores from Saturday's games here. The only FCS over FBS win was Central Arkansas over Western Kentucky, which is not saying much. The Sports Network on the first ever regular season game between the Hens and the Hornets. There is no joy in Orno, ME. Slow news day so far, so we'll do some recruiting in the next post. UMass writeup here with notes, quotes and a photo gallery. Matty Vautour says UMass holds off the Rams in CAA opener. Matty's three stars for the game were Kyle Havens, Tony Nelson and Kurt Filler. The Boston Globe has a game article here. The Springfield Republican here. Ron Chimelis comments on Kurt Filler's first career interception and the big hits delivered by the UMass defense. Josh Samuda was back at LG after siting out the second half of the Albany game. Jared Chivers played most of the game at center, but starter John Ihne was in uniform and was in for a couple of plays. Mike Mele was in uniform for the first time, but DNP. David Cozzo played quite a bit in the second half after Corey Davis got nicked. Syracuse transfer Dan Sheeran played in several of the WR packages. The CAA website has coverage of all the CAA games from yesterday. I'll be back, maybe this evening, with a web album of the game. Great day at McGuirk. I got to meet Kumar Davis' dad and the guy (I missed his name) who runs the Springfield Republican's website. Kyle Havens was on fire in the first half going 15-17. The UMass defense did not give up a touchdown and did some monster hitting. Jeromy Miles, Corey Davis and Kumar Davis all had NFL quality hits. Tony Nelson was unstoppable in the fourth quarter. 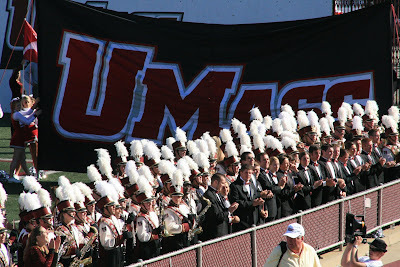 And the UMass Marching Band's sound is just superb this year! That's it for now. I'm pretty tired. Congrats to UMass for a great game. Matty Vautour says Rhody is first up in UMass' title quest. He picks this week's games. The Springfield Republican has a game-day article here. The Providence Journal says injured QB Chris Paul-Etienne will be ready to play against the Minutemen. Dish Network will carry the game on Dish channel 435. CSN's Terrance Thomas Sr has this week's "CAA Today" Column here. Chuck Burton says the CAA is a Completely Awesome Association. 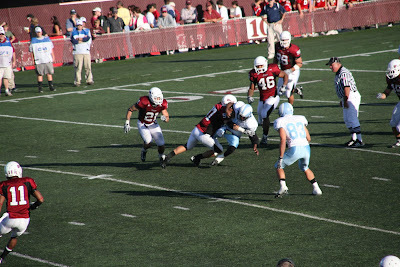 Rhode Island @ UMass- Rhody looked strong against Fordham. The Rams are in the second year of their transformation from an option team. They look much improved. UMass needs a conference win. 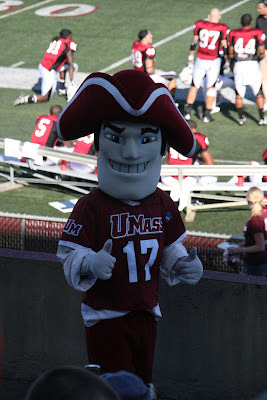 With the Minutemen's strong home record, UMass should be favored. Hofstra @ Richmond- Some pundits (Phil Steele) picked the Pride (1-0) as high #4 preseason based on their 18 returning starters (the most in the CAA). Richmond (2-0) looks as if they are a National Championship contender again this year. Today's game should show if Hofstra is going to live up to the hype. Maine@ Albany- The Black Bears (2-0) have played two weak opponents in St. Cloud State and Northeastern. The Great Danes (0-2) are looking for a fresh start. New Hampshire has a bye. Youngstown State@ Northeastern-The Penguins (1-1) got blown out at Pitt and didn't look that good in a game against Austin Peay. Northeastern (0-2) was hammered by Boston College and lost to Maine last week. The Boston Herald says the Huskies are already in a must-win situation. Delaware State@ Delaware- The Blue Hens (1-1) lost to Richmond in the last minute of the game last week. The Hornets (0-1) lost to Flordia A&M in their only game so far. Delaware has dominated the few games played between the two teams and should win again easily. 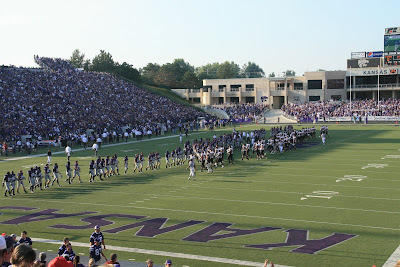 VMI @ James Madison- The Dukes (0-1) beat the Cadets (1-0) 41-17 when they played in 2007. No reason to suspect a different outcome this time. VMI had a one point win over Robert Morris last week. Villanova@Penn- Villanova (2-0) beat Temple in their opener and crushed Lehigh last week. Penn (0-0) took the Wildcats to overtime last year (20-14 loss). This could be the best game in the CAA against an OOC opponent this week. Coastal Carolina@Towson- The tigers (0-1) don't have many chances to win this season. This could be one of them. The Chants are (1-1) this season. They lost to Kent State and beat Monmouth. William & Mary@ Norfolk State- The Tribe (2-0) beat Norfolk State (1-1) 42-12 last year. the outcome should be the same this year. BTW, Kansas State gets UCLA this week. The Rhode Island student newspaper has a look at Saturday's game from the Rams side here. Matt Vautour says that UMass has been prepping for the Rams. Rhody finally has its game notes up. Html here and pdf here. Chris Paul-Etiene 6-3 200 pd Jr QB transfer from Rutgers makes Rhode Island go. CSN's Bruce Dowd has his weekly column "Dowd's Den" here. Chuck Burton has a long article on the CAA and this week's FCS games here. Brett Kahn of CSN previews this week's FCS games and picks UMass over the Rams (so does Bruce Dowd, so that is a worry). Dave Coulson cover FCS news including "What's going on at Georgia Southern"
UMass is recruiting pro-style QB Michael Quinn of Wayne Hills HS, New Jersey. Quinn is 6-3 and 195 pds. His Rivals page is here. 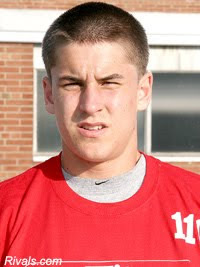 Quinn is the third ranked pro-style QB in New Jersey. Also being recruited by Buffalo, Harvard, Hofstra and Yale. Matty Vautour reports that five previously injured UMass players are "Probable" for the Rhode Island game. Two of them Syracuse transfer LB Mike Mele and Senior OT Rob Getek have not played so far this season. D.J. Adeoba played a strong game at Kansas State and John Ihne is the starting center. Jeromy Horne was the third leading receiver in the CAA last year. All five are potential starters and would make a strong addition to the team. How early can we start recruiting a player? Biddeford's Nate McKeon is the son of former UMass LB John McKeon. Nate's dad holds the UMass single season tackle record of 177, as well as the career total record of 543 tackles (1985-1988). The Bleacher Report has an article about the UFL and mentions Marcel Shipp. Seven CAA teams are ranked in FCS' top twenty five. Some people are already speculating that the CAA will equal its record five team selections for this year's playoffs. Could the league get six? A couple of stories from The Sports Network: one on Richmond QB Eric Ward and another about McNeese State's big win at Appalachian State. 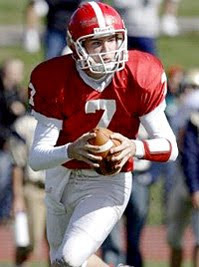 UNH's QB R.J. Tolman won the New England Gold Helmet Award for his performance at Ball State. Image by the K-State's student newspaper's Sara Manco. His Rivals page here. Scout.com (with video highlights) here. More video highlights from MaxPreps. Drawing interest from CAA teams UNH and JMU. Also interested are Harvard, Holy Cross and UConn. UMass' game notes for the Rhode Island contest are up. Html here and pdf here. The Patriots website mentions James Ihedigbo in this write-up on the coming Jets game. I blame Jason Yellin for not sending me the e-mail. From the Bruins Nation write-up on their game with Kansas State:"The Wildcats struggled to beat UMass at home (a team which just started playing D-1A ball this year) and then they lost to Louisiana-Lafayette by a score of 15-17." The weekly CAA press release is up (includes information about this week's games). The Bleacher Report's Sara Hannon explains why JMU's Mickey Matthews is the worst coach in FCS football. Sophomore LB Tyler Holmes is the subject of this article by the Springfield Republican. 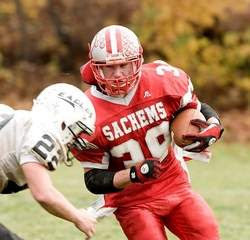 MassLive.com (Republican) also has a slide show from the Albany game. The UMass Athletic Website has a transcription of Coach Morris' weekly CAA telephone conference. CSN has their National Players-of-the-week for 09/12/09 here. New Head Coach Joe Trainer had fun in his first game at Rhode Island . The Rhode Island student newspaper says the win over Fordham was a team effort. UMass didn't move in the Sports Network poll. Or the Coach's Poll. Sports Network's Brett Kahn on last Saturday's game between Richmond and Delaware. Keepers College football ratings has UMass by 18.84 over the Rams. He has UMass at #13 in his FCS Rankings. 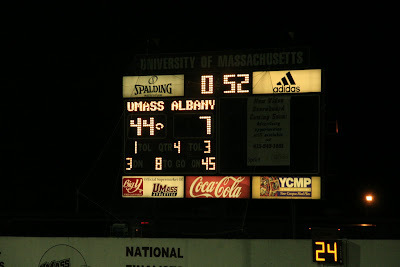 I have a 42-image Picassa web album of the UMass-Albany game here. 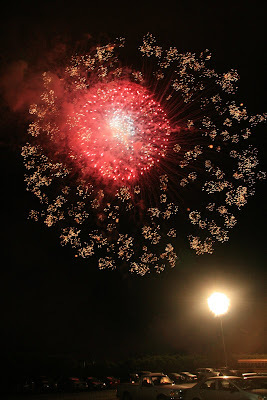 As usual, the high ISO (I usually set the camera for 1,600 ISO for night games) makes the images somewhat grainy. The long focal length can add some blur too. Hope they give the out-of-town viewers a feeling for the game. Whoa! 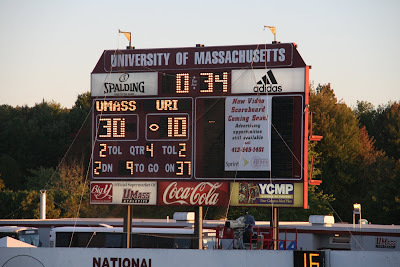 The UMass has this note in today's UMass Minute: "If you were at the game on Saturday, you saw the sign shown in this picture, letting all the fans know that a new video scoreboard is on the way for McGuirk Stadium. Plans are for the scoreboard to be installed for the Oct. 17 homecoming game against New Hampshire." I totally missed the sign. That's great news. The old scoreboard has been an eyesore for years. Kudos to UMass A.D. John McCutcheon. The new scoreboard will be a great addition to McGuirk and the UMass Football atmosphere. The Boston Herald says Coach Morris' first victory was sweet. The Salem News covers Armando Cuko's contribution to the win. University Albany's notes and stats from the game. Matty Vautour discusses the Albany game and gives some information on injuries. UMass lost John Ihne, Josh Samuda and Jeremy Horne during the game. In addition D.J. Adeoba (knee) and Shane Viveiros (hip) DNP because of injuries suffered against Kansas State. Vladimir Ducasse and Jeromy Miles are in the top 20 "Small School" NFL draft prospects from JBS Scouting. CSN recaps all the FCS scores from 09/05/09's games. The ProJo says Liam Coen was the best QB to come out of Rhode Island in the last 50 years. UMass Athletic Dept story with notes and quotes here. Matty Vautour has an article on the game here. His three stars for the Albany game were Victor Cruz, Jeromy Miles and Jared Chivers. The Boston Herald says Kyle Havens was right at home. WWLP said UMass routs the Great Danes. 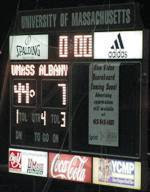 The Springfield Republican said UMass crushed Albany. The Albany Times-Uion says turnovers did in the Great Danes. CAA write-ups on all of yesterday's games here. New Hampshire bagged another FBS/I-A win over Ball State. Another article on New Hampshire's win here. Key Quote: "Ball State looked more lifeless than week-old road kill for most of the game"
James Madison took the Terps to overtime. No joy in Manhattan as the Wildcats lost to Louisiana Lafayette. Article from the Ragin' Cajuns side here. I'll be back later with a web album of images from the Albany game. Whoa! UMass dominated the Great Danes holding them to 10 first downs. The defense forced five turnovers and looked even better than they did at K-State. UMass All-American safety Jeromy Miles lit up Albany leading receiver Tim Bush with an NFL quality hit. Kyle Havens threw for 284 yards and still had a couple of drops. We did have some injuries. Jeremy Horne went out with a concussion and we lost Josh Samuda and John Ihne with shoulder injuries. I don't know how serious any of those were. I did not see Josh Jennings' or Mike Mele's jerseys on the sidelines. Big effort by the Minutemen and a big win. Drove home listening to the Kansas State feed on Sirius satellite radio. 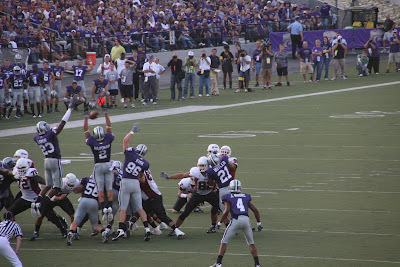 The Wildcats missed three field goals and an extra point to lose to Ragin' Cajans 17-15. Be back tomorrow with news links and a web album. UPDATE: UMass-Albany is listed as an internet video feed (free) on channelsurfing.net. In past experience, sometimes that works and sometimes it does not. If you are not in New England and can't get to the game, it's worth a try. The Springfield Republican on UMass' preparation for Albany. The Albany Times Union says it's getting tough for Albany to fly under the radar anymore. Matty Vautour has an article on the coaching connections between UMass and Albany. The Great Danes RFr. Andrew Smith is thinking touchdown every time he touches the ball. Tony Nelson does a nice job in this transcription of his Friday on-line chat. Before you leave for the UMass game, set your VCR for Comcast Sports New England at 3:30 pm. They're carrying Richmond@Delaware. Coach Morris' UMass show is also on a 1:45 am. The Worcester Telegram has an article about Holy Cross' Dominic Randolph being the best QB in New England. The Washington Examiner says the ACC is down and the CAA is up. Matty Vautour says the Minutemen are looking forward to playing under the lights. Matty's picks for week two. Is it just me, or does anyone else notice on how little respect UMass received from their near upset of a Big 12 team? Chuck Burton reviews this week's Top-25 FCS games and picks Albany over UMass. He says he won't be surprised by the upset. 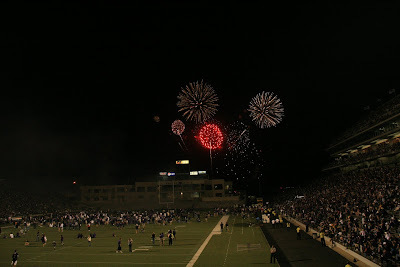 Bruce Dowd and a long and excellent article about attending three FCS games last weekend (Villanova, Appalachian State and Richmond). Continuing the run of CSN writers Terrence Thomas Sr. looks at the CAA's games last week. 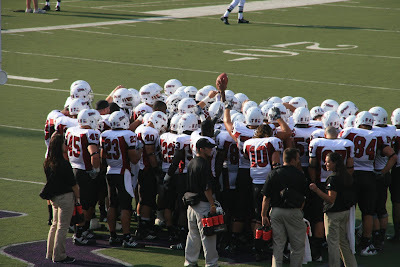 David Coulson looks at the UNH vs Ball State and other FCS news here. Seacoast online says the Wildcats may be without TB Chad Kackert. This on-line sports book has UMass by 18 1/2. The CAA has seven teams in the FCS top-25 and five of the top ten polls. William & Mary's B.W. Webb won the National Defensive player-of-the-week by the Football Writers Association of America. JMU is familiar with the way Don Brown is doing things at Maryland. UPDATE: Chat with UMass RB Tony Nelson Friday @11:00 am on the UMass Athletic Dept website. Brett Kahn of the The Sports Network previews this week's games involving FCS Top-25 teams. UMass Head Coach Kevin Morris' weekly CAA telephone conference session is here. Smart Football on what makes a bad offense bad. NFL Dreams Dept: Tony Nelson had an impressive showing at K-State last week. He averaged 5.6 yards a carry. More importantly, he was getting stronger in the fourth quarter. Nelson's 107 yards and 5.6 yards/carry were the best totals by a UMass running back in an FBS game I can remember. If Nelson is going to have a shot at the Pros, that's the way he's going to have to play. NFL Dreams Part II: After the UMass-Appalachian State National Championship game in 2006, I talked to a professional sports writer. He said about James Ihedigbo "That hit (meaning the one on Mountaineers QB Edwards) is going to put him in the NFL." Last year we had a couple of highly rated defensive backs that did not stick in the Pros. This year's UMass defense seems have put the thump back into UMass defensive play. 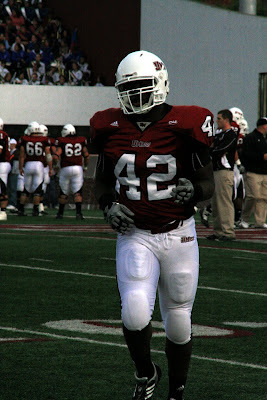 If anyone on the UMass defense has NFL aspirations, then they need to hit like James Ihedigbo. 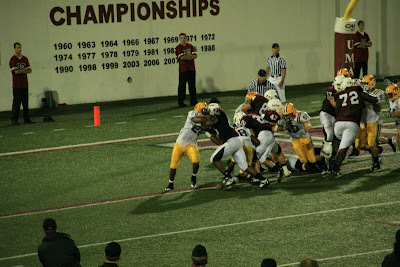 I have a Picassa web album of the UMass-Kansas State game up here. A couple of notes about the album: I was seated in the end-zone and it seemed as if the whole game was played in the opposite end of the stadium. The combination of using a zoom lens and the low light means some of the images are fairly "soft". However, I hope it gives a sense of what it was like at the game. 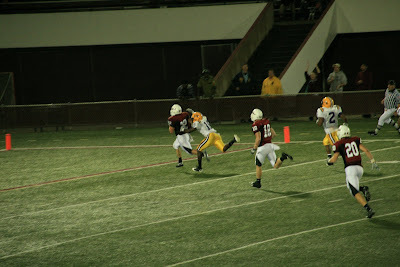 The really blurry image is of the UMass touchdown. I was bumped as I took it, but it sorta conveys the fast motion of the play. Note the very small "magnifying glass" symbol in the upper right hand corner of the display page. Piccasa will display a much larger view of the image with that enabled. Ah-- the perils of incomplete information. It turns out that the winner of the UMass Football Blog Hat contest knows a thing or two about football. The contestant that won was Noel E. Schablik. He won two varsity letters playing football back in 1967 and 1968. I'll ship the hat off today. UMass has the game notes for Albany up here (html) and here (pdf). 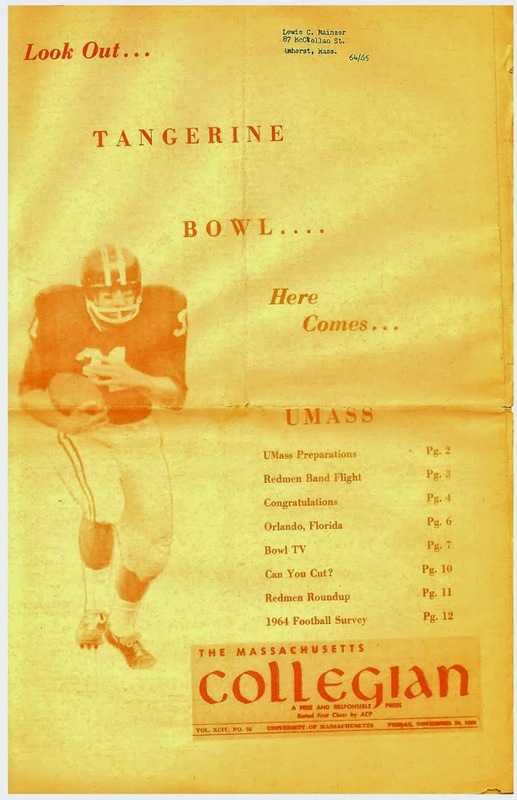 Albany's game notes for the UMass game here (pdf). On the UMass two-deep chart: congratulations to UMass RG Jared Chivers RSr 6-4 260 who cracked the starting lineup in his last year in the program. Chivers was so far down in the lineup preseason he does not even have a page in the UMass press guide. Chivers is listed as backing up the RG position in addition to his starting at LG. Matty Vautour has an article about the UMass defense. Vautour mentions the excellent play of KeMon Bailey in his first start at CB. He also covers the rebirth of the linebacking corps with D. J Adeoba and true freshman Perry McIntyre playing well. He also mentions Syracuse transfer Mike Mele has been sidelined with an upper body injury (no information about when he'd be back) and fourth string QB Spencer Whipple has left the program. I would like to add that I was there and UMass defense did an excellent job. They shut down the Wildcat offense in the second half. The CAA has state-of-the-league and Sept 12th game previews here. Three follow-up game articles about last Saturday's game from the Kansas State side here and here and here. Dave Coulson of the Sports Network covers the upsets and near upsets in FBS/FCS play last Saturday. Keepers college football ratings has UMass as #18 and CAA teams rated #1 to #4 in the nation. He also has UMass by 11.72 over Albany in his game predictions page. We have a winner in the UMass Football Blog Hat contest----and just to make things interesting it's the only entry I don't have a valid e-mail address for. Noel E. guessed K-State 21-20 over UMass. Noel, my e-mail address is in the "About Me" sidebar. Please contact me ASAP so that I can send you your hat. If I can't get in touch with Noel, then the hat will go to Cynthia P., who was second closest with a entry of 21-20 UMass over K-State. The two women crushed the male readers, most of whom guessed much higher scores. There were 19 entries and the average guess was K-State 33.4 UMass 18.25. Hi everyone, Mrs Blog and I made it home safe. I'm tired but happy we make the trip. I had some more e-mails while I was gone with entries for the hat contest. I'll try to sort through them and have a winner by tomorrow. Hope also to have a Picassa web album of the UMass-Kansas State game up by tomorrow also. 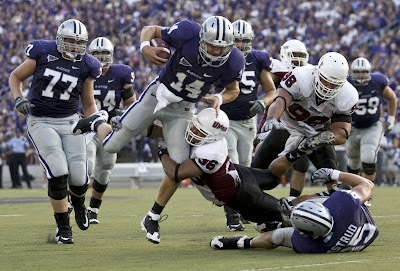 The Springfield Republican says UMass has regrets about the K-State game. The Wichita says the Wildcats try to learn from the UMass scare. Matty Vautour has several articles. He has an article about the CAA's strong showing against FBS/I-A teams. He notes that UMass will get Armando Cuko back from a one-game suspension, but projected starting RT Rob Getek may be out for some time. He also has "Three stars -Kansas State". He also takes a look at the season yet to be played. UMass' strong showing against the Wildcats didn't translate to much movement in the polls. D.J Adeoba was CAA Rookie-of-the-Week for his performance against K-State. "Offensive coordinator Mark Whipple's new schemes were an instant hit with the most important Miami fan: university president Donna Shalala, who beamed after Miami rolled up 229 yards on its 29 first-half plays, a 7.9 average." Well, Mrs Blog and I toured the US Calvary Museum and the Custer House at Ft. Riley yesterday. We ate supper at the "So Long Saloon" in "Aggieville", which is a bunch of shops and restaurants that cater to the K-State students. We'll be making the drive to Kansas City airport in a couple of hours. Five new post game articles from the Wildcat side here. From the UMass side, the Boston Herald has a review of the weekend New England games. CBS Sports has a article on the league victories here. I've already blogged about the three CAA wins over FBS/I-A teams, but there was some strange results in the northeast. DII St. Cloud State took Maine to overtime. Winless (in 2008) St. Francis gave UNH a good game. And Patriot League bottom-feeder Georgetown gave Holy Cross a hard time. BTW, next week's opponent Albany had a narrow loss to Georgia Southern. It was a good week for UMass alums as both Matt Lawrence and James Ihedigbo made the Ravens and Jets rosters respectively. Jeremy Cain made the Jacksonville Jaguars. Very foggy this morning. Mrs Blog and I had a great time at the game last night and I'll say again---we were very close to winning. Fifty-One thousand took in the game in Manhattan last night. Game story by the Hampshire Gazette. The Springfield Republican says UMass played the Wildcats close. UMass athletic dept write-up here. Three CAA teams beat FBS/I-A teams this weekend! That's got to be a record by a FCS conference for one week wins over FBS teams. William & Mary crushed Virginia. Whoa! We could have won this one. Well, first thing the UMass defense is back. We shut out a Big 12 team three of the four quarters and we flat out pushed them around in the second half. 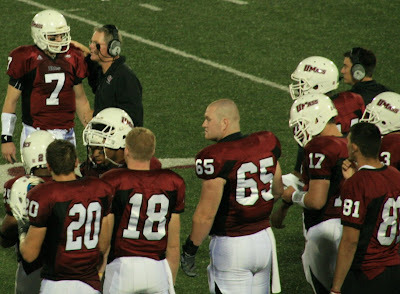 The UMass defense got pressure on Coffman all night and sent him to the sidelines for one series. If it were not for the last series in the first half (what was the coaching staff thinking?) we would have won 17-14. The offense had some good things and some things to work on. Tony Nelson and the OL got stronger as the night went on. The bad thing was we had a LOT of drops. Havens probably could have added five receptions with better concentration from the receivers. Still, there were a lot of positives. Again, we could have won this thing. Good luck with the rest of the season to K-State. I enjoyed talking to tons of friendly Wildcat fans. We are staying over tomorrow and flying home Monday. I've got lots of images so I'll have an image gallaery to post when I get home. And I'll have to check the contest e-mail folder to see who won the hat. I know a couple of people picked UMass to win, but I don't remember if anyone had the Wildcats by four. 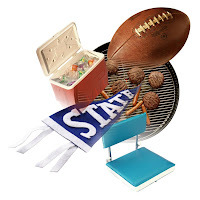 A K-State athletic dept image. Matty Vautour says UMass has a big test in the opener. Kyle Havens is in the hot seat. WWLP has UMass set for the season. 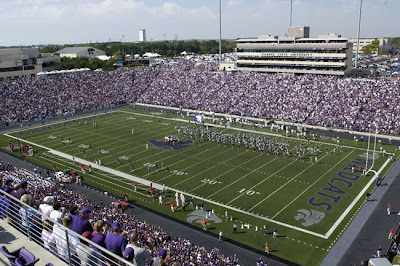 Ron Chimelis does a guest blog on "Bring on the Cats"
The Kansas State Collegian scouts the Minutemen. BTW, it didn't take long for FCS to win one over FBS as Villanova beat Temple 27-24. That's the fifth straight year a CAA team has beaten a FBS/I-A team. And Big Ten Team Indiana just bearly escaped EKU. Looks like a big crowd here in Manhattan. Mrs. Blog and I have already run into some UMass folks. Memo to Wildcat fans: I only saw Kansas stuff in the Kansas City Airport shops. The NCAA has a new thing for teams to shake hands before kickoff. Wonder if that will happen tonight? It didn't work at Oregon. My motel wireless connection is a little slow, so I'm going to stop now. I'll probably post some comments after the game.